Los Angeles auto dealer Hilton Tupman wanted to level the playing field between motorists and pedestrians. 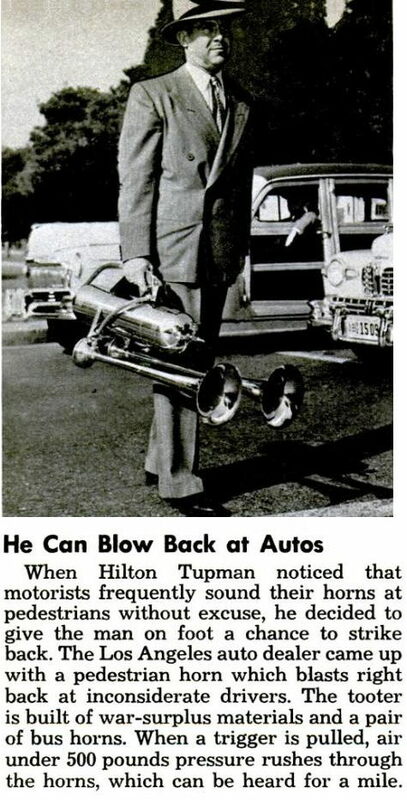 So he invented a horn that pedestrians could use to honk at motorists. And he made it loud enough to be heard within a 1-mile radius. Awesome! Although carrying that bad boy around, just to get back at car toots, might indicate an OCD tendency. Only a mile??? My old '39 Plymouth's ahooga horn cold do that. This thing would make Joshua jealous! Blow it a couple of times and go deaf! Horn blows, does the walker?? Joggers around here carry batons - mostly to discourage aggressive dogs. If it looked a little more intimidating - say like a sawed-off 12 gauge - a baton could even intimidate cars. In *certain* neighborhoods the police might even give you a pass - if you looked like you belonged there. How long to pump it up to 500p.s.i. with a bicycle pump? This horn looks like the perfect accessory for a protest. Even though it looks expensive compared to a vuvuzela, unions and organizations usually have the budget for that stuff. The automotive workers could even build one themselves! @KDP I'm not sure the seals in a bicycle pump would handle 500 psi. We have an industrial air compressor at work, but by the time I got home, I probably would have use all the air pressure up. 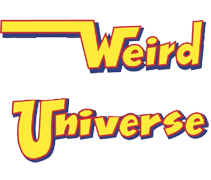 I do like the idea though.